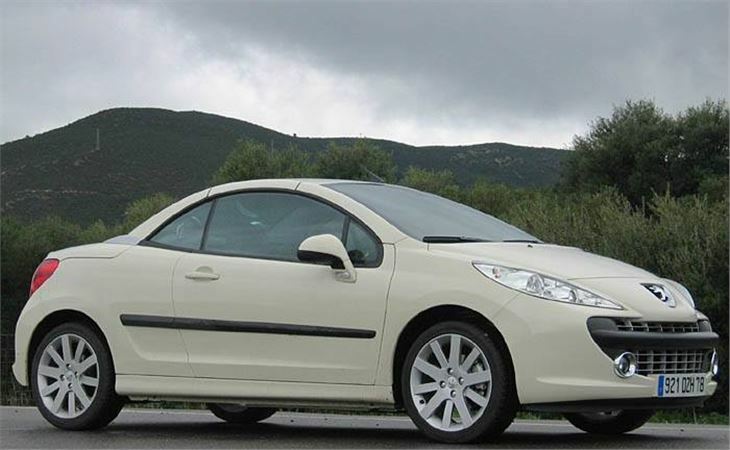 This test of the Peugeot 207CC very nearly never happened. Flying into Jerez for a visual landing in low cloud the pilot of our A321 Airbus forgot to get his gear down and had to abort in the last few seconds. After that, he had to find the airport again. I’ve never circled and banked so close to the ground in a plane as big as an A321 before. Nor stood in such a long queue at the airport toilets. 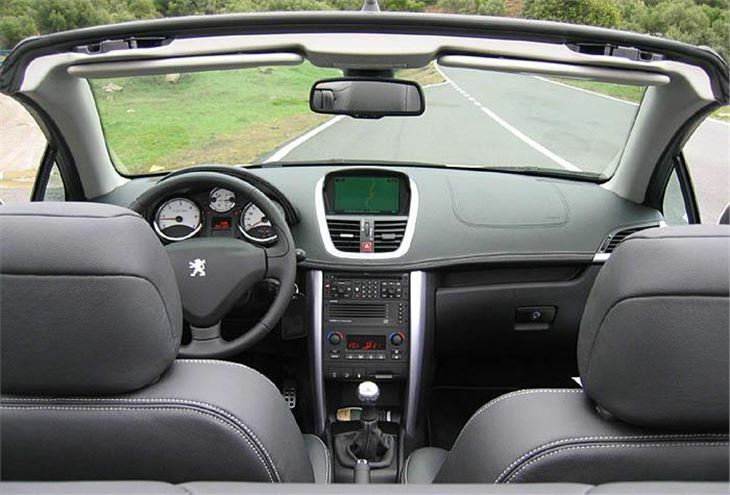 After nearly wiping us out to get us there, we reflected, Peugeot better have made a decent job of the car. And the weather didn’t help. It was to be my second test of a convertible in two days in winter mist and rain. 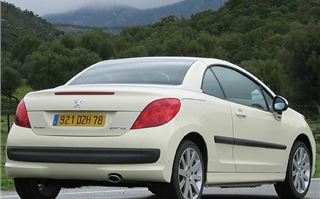 The 207CC is better looking than the 206CC it succeeds. (Which, incidentally, sold a whopping 366,900.) And it comes in some very attractive colours (see the specs below). Best of the lot is the lovely ‘Parthenon White’: a sort of very pale creamy ivory, as you can see in the photos. There will be three engines, eventually. On test we tried the 1.6 HDI 110 diesel and the 1.6 THP 150 turbo petrol, just like my long-termer 207 hatchback. 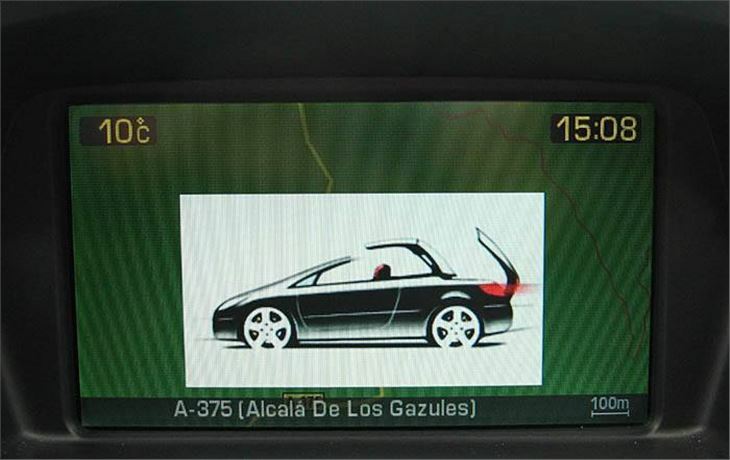 Launch date is 1st March 2007 and a little later we’ll see a 120bhp non-turbo 1.6 petrol with 5-speed manual or four speed automatic transmission. Being 8” longer and 3” wider than the 206CC, there’s marginally more room for dwarfs, pygmies and small children in the back. 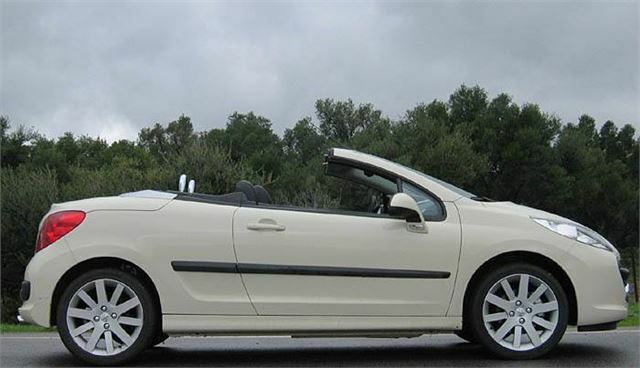 But Peugeot has used some of the extra length to include pyrotechnic roll bars that explode upwards to give rollover protection in the unlikely event you ever flip the car. To me, the real advantage of the 207CC over cars like the MX5 is the extra cabin space the rear seats give you for luggage. 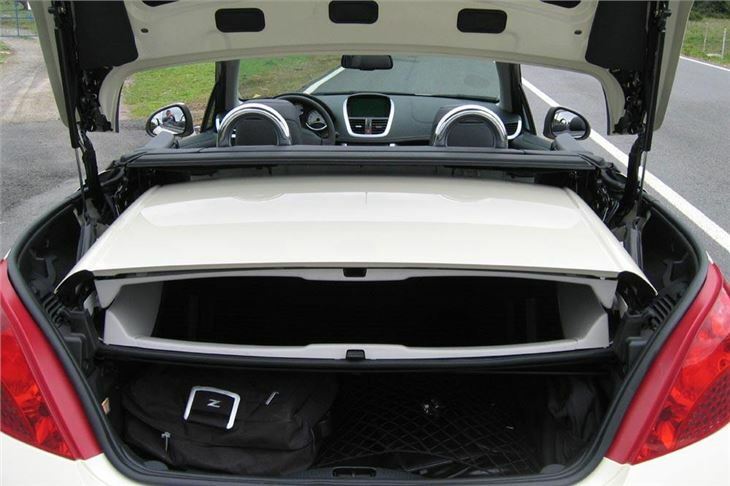 You could probably get most of the 262 litres taken up by the roof in there, giving you the option to tour top-down, then lock everything in the boot top-up when you leave the car parked. With the optional £160 folding windbreak in place (£160??) there’s very little buffeting, even at speeds you are unlikely to travel. The body is also impressively rigid (46% stiffer than the 206CC) and the software of the electric power steering has been re-programmed slightly to give even better ‘feel’ than the 207 hatchbacks. So it’s just as good to drive quickly, which is a real achievement. Part of our route was sinuous recently tarmacked blacktop, not much more than a car width wide with foot deep drop-offs either side. It was like driving along the top of a wall, so we had to be accurate. And happily the steering was. Buyers will probably debate endlessly the relative merits of the 110bhp diesel versus the 150bhp petrol, both with the same 180lb ft torque. So I’ll attempt to help you make up your minds. On one side of the argument, the 54mpg of the diesel is first past the pumps against the 39mpg of the petrol (more realistically, about 48mpg v/s about 35mpg). But the diesel torque does not come in until much higher in the rev range: 1,750rpp v/s 1,400rpm from the petrol. So rather than offer a more relaxed drive with fewer gearchanges, the diesel is the opposite. Then if you are considering the 207 as an alternative to a sportscar like the MX5, the THP 150 petrol is the only choice. You can actually get sportscar driving pleasure from it. Well I did, anyway. 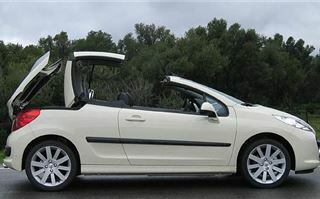 And that can’t be said about any of the other coupe convertibles on the scene, such as the Micra CC, Colt CZC and Tigra. 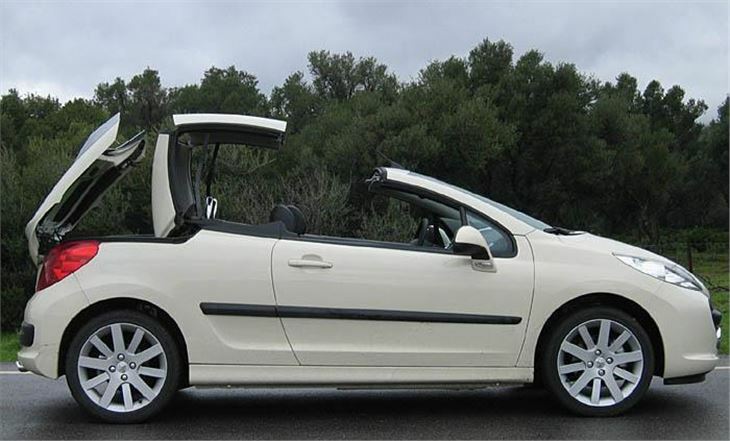 If you want to spend a bit of money on it, you can also accessorise the 207CC, as you can a MINI. I recommend the rather expensive combined satnav, traffic report system hands free phone, CD multiplayer and radio because I’ve got one in my own 207. But I also liked the optional ‘Alezan Brown Integral leather’ that covers not just the seats and doorpanels, but also the top of the dash and works very well with either solid Parthenon White or metallic Onyx Black. But now I’m starting to get into areas perhaps I shouldn’t. 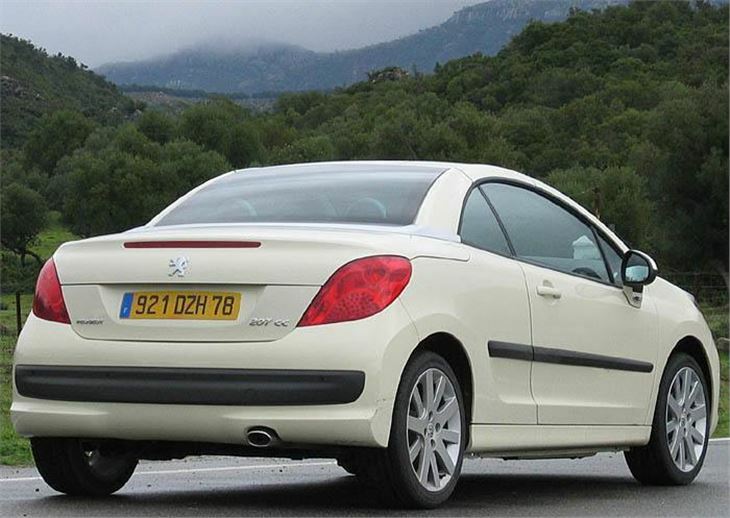 Because though I like the 207CC, it’s not really a bloke’s kind of car. I’ll just have to buy for the wife, then.